Since we went to Disney last fall, didn't make any grand summer vacation plans this year. But by the time July rolled around, we were all getting a little bored sticking close to home. 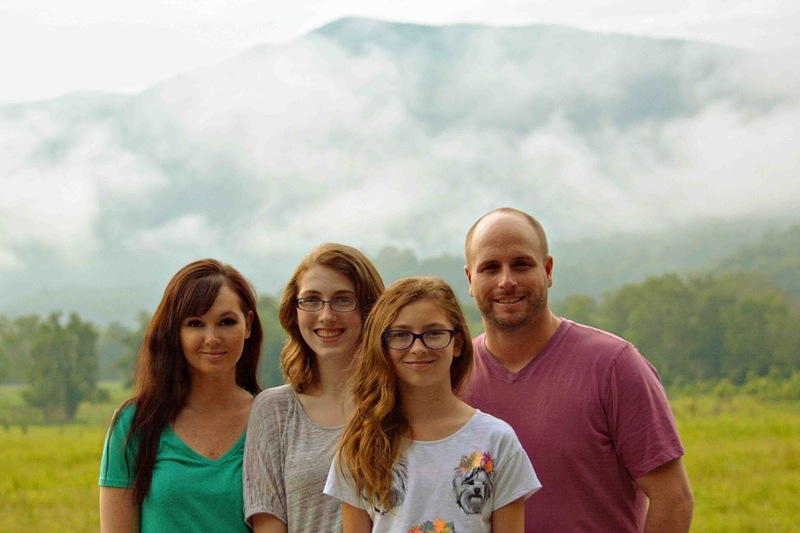 We've been talking about making a road trip to Tennessee for quite some time, so we tossed around some ideas and decided we would take the girls to The Smoky Mountains. I'm so glad we had a last minute summer vacation before the girls went back to school. Even though I spent a lot of time in TN on my grandma's farm as a child, I forgot how breathtaking it is there. It's a trip my girls will definitely remember forever! Our first morning, we did a little bike riding through the mountains. 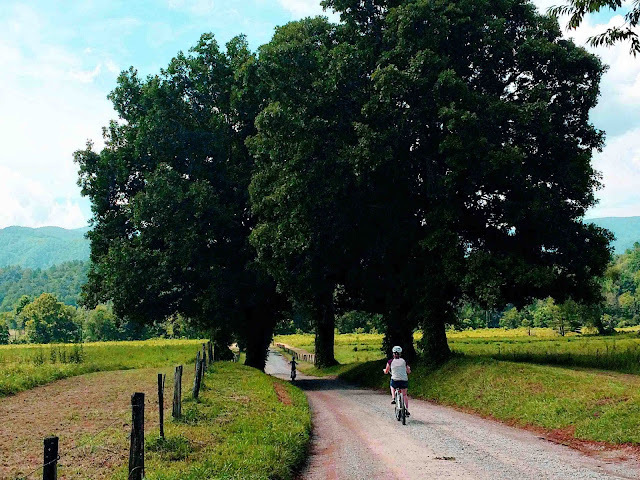 In Cades Cove you can rent comfort bikes by the hour. It is a one way road and you do have to ride along with the cars, but it's still pretty safe for all ages. The trail is 11 miles long, but since it was sooo hot out, we only did the 8 mile loop. 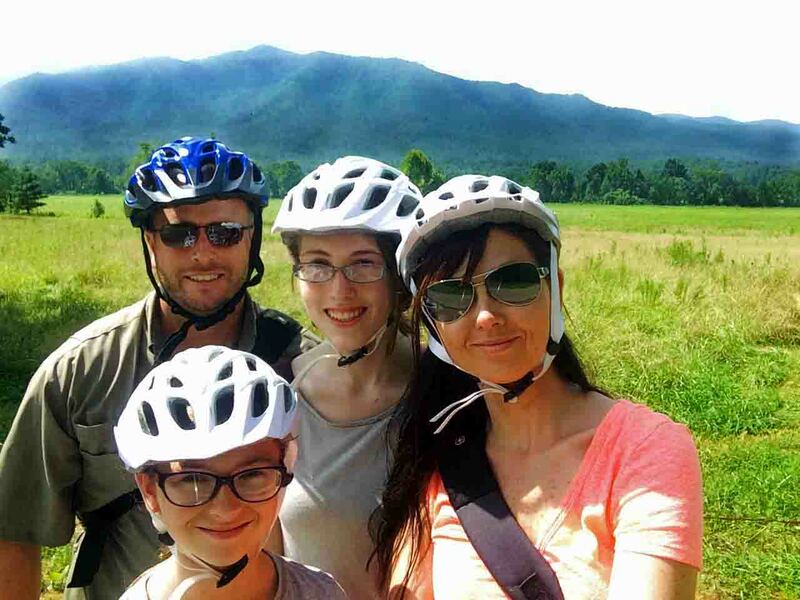 We did the 8 miles in about 2 hours, so the bike rentals only cost around $50 for the 4 of us. Later that afternoon, we planned an hour long horseback riding session. This activity isn't cheap, costing around $130 for the 4 of us. 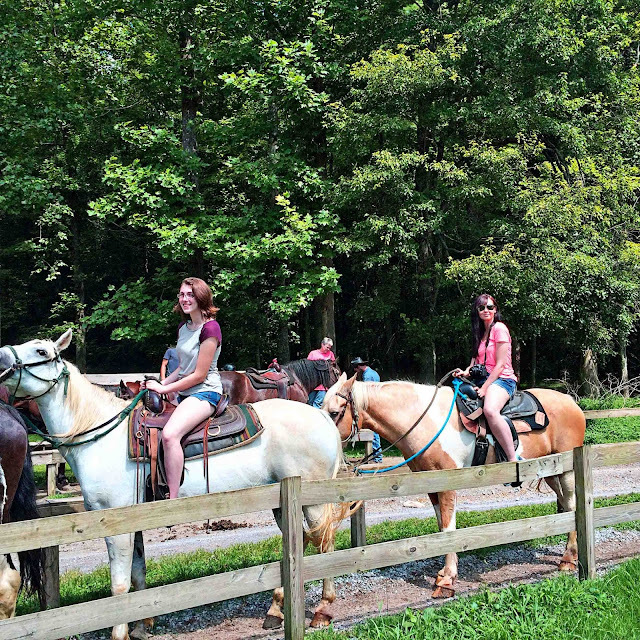 However, riding horses through The Great Smoky Mountains is such an amazing experience, it's well worth the cost! 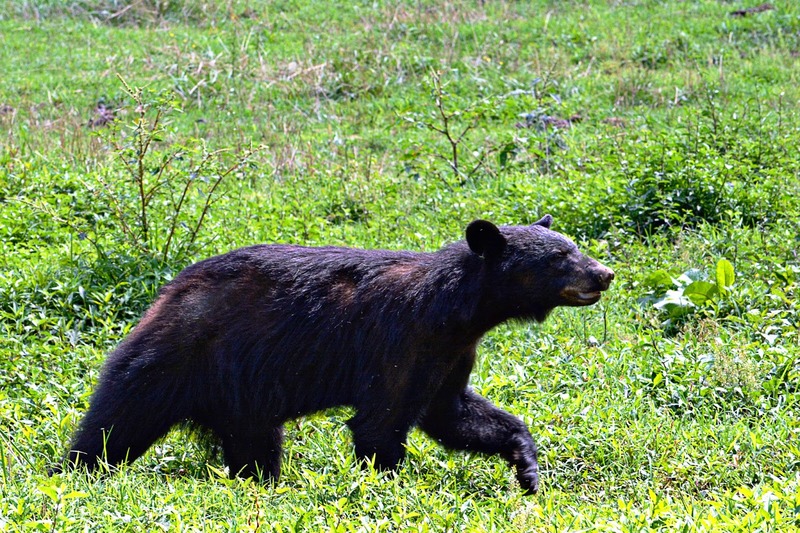 As soon as we returned back to the stables, who should appear but a hungry black bear! We didn't see much wildlife, short of a few turkeys, so we were pretty excited to see a bear out in the open! He wasn't too concerned with us humans, he just wanted a little of the pony grub. The stable boys chased him off before he became a nuisance. Honestly, I was a little disappointed we didn't see more wild life, but maybe we just weren't looking hard enough. On our way out, I somehow spotted this little beauty camouflaged in the trees and made Jason go back so I could snap a quick photo. 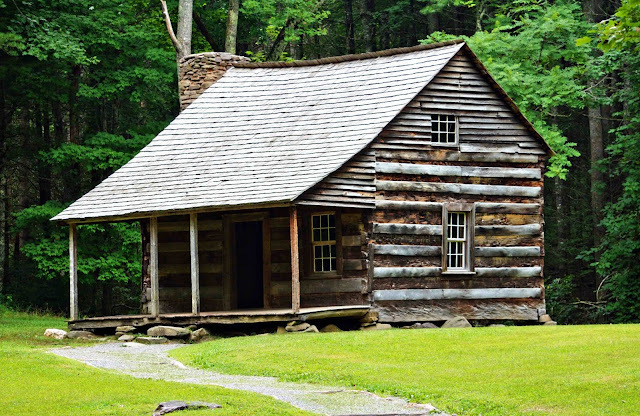 We were intrigued by the cabins and churches in the park because they were all leveled onto heaping piles of rocks. It looked weird, but they were all very stable. We were only able to stay a day and a half, but we are dying to go back soon. There is so much more we want to explore, you just can't enjoy it all on such a short time frame. Barely awake. Very early morning and the smoke/fog is just rolling through the mountains! Simply stunning views! Have you been to The Great Smoky Mountains? Where is your dream road trip destination? Since summer is winding down, I thought I'd host a little giveaway for my readers for their back-to-school shopping. Now through 8/8, enter to win $15 to Amazon! Giveaway is open to my readers worldwide! Winner will have 48 hours to respond to winning email before a new winner is selected. *All entries are verified, so please make sure you are properly entering for the entries you claim. **Amazon is not a sponsor/affiliated with this giveaway. I remember going to the black hills when I was a kid. We had a great time except for the camper bus we had breaking down 3 times. Going cave hunting was probably the highlight of our summer. Tomorrow we're going to my families reunion at a state park. It should be fun. I love my childhood memories of going to Pike's Peak and visiting family. Back then it was still open to the public so you could walk up the peak. My most memorable summer family vacation was a cross-country road trip. It included a stay at San Diego. I loved the Zoo and La Jolla. I'm ready to go back! Our most memorable was my family's trip to the Grand Canyon out west. We rode mules through the Grand Canyon and the sights were beautiful! Our most memorable was a trip we took from Seattle to San Francisco along the coastal highway. The views were spectacular. My most memorable family vacation was my parent's 50th anniversary get together in Walt Disney World. Family members from all over the country met at WDW and it was awesome. My most memorable summer vacation was traveling to Portugal with my husband when I was pregnant with my 1st child. Our favorite summer vacation was when we flew out west and did a road trip. Our first stop was the Grand Canyon which was beyond amazing. After a couple days there we headed to Paige, AZ then on to Zion Nation Park. We then headed to Las Vegas, NV for a couple days. We left there and took in the Hoover Dam and stopped in Williams, AZ where we saw a fun cowboy show. Then we went on to Sedona where we enjoyed a jeep tour and a fun visit to Slide Rock State Park. We hit a few other sites and then headed home. Our boys still rave about this vacation which was taken 6 years ago. OMG those two photos with all of you in front of the mountain are out of this world. Especially that last one! You could sell it for big money :) Put it as your cover at Face! Looks really amazing... I really love your camera... it makes such quality photos. And look at all those lovely animals! The bear!!! I really don't like how we all look in that photo. We were running on like 5 hours of sleep. I woke up and straightened the girls hair because I knew we would be getting family shots, but the humidity was so hit, Mariah and Allison's hair curled right up as soon as we stepped out the door, and my waves went flat and frizzy. Not to mention how puffy we all look from lack of sleep. I do love the background though! What the what? What shrooms did you eat today, sweet sister, you is looking like a top model on that last one, the girls look cute and the hubby looks hunky. 'tis a stunning family photo, the background, the setting, the light... even your outfit matches the photo lovely with the setting. Oh, darling Dezzy, I'll be sure to mail you some new glasses soon. You need them ;) Next time we go back, I need to remember my anti-frizz hair cream. I always thought Tennessee was a dry heat. I didn't realize the humidity is close to what Florida has. It really played a number on all of our hair there. Well, except for Jason, because he doesn't have any! bwhahaha! My daughter and I had a trip to Hershey, PA one year and the most memorable part was that we found the best pizza in the US. We love JoJo's Pizza! We loved our vacation to New York City a while back-we saw all the sights, and some shows, too! My most memorable vacation was the one were we all went to California to LA and San Diego. We saw all the gorgeous beaches up and down the California coast. We went to the San Diego ZOO. It was so much fun. We also went to Disneyland and Universal Studios. We loved this vacation! My most memorable summer family vacation was a RV road trip from MN to GA with my cousins, grandparents and brother and mom when I was 10. I would have to say my most memorable was we all packed it in a camper my dad rented and went down to Texas. We had so much fun and such a neat experience seeing the world! Most memorable family vacation was a trip to Denver CO. It was our first time there and we loved all of the natural beauty. My most memorable was taking the kids to Disney and they just lit up when they got there. I need to take them again sometime sooon because some were young and their memory they no longer have. That is an awesome vacation! My boys would LOVE it there. We just returned from Dana Point, CA and Lego Land, CA. Great memories with the kids! Those are some AMAZING photos! 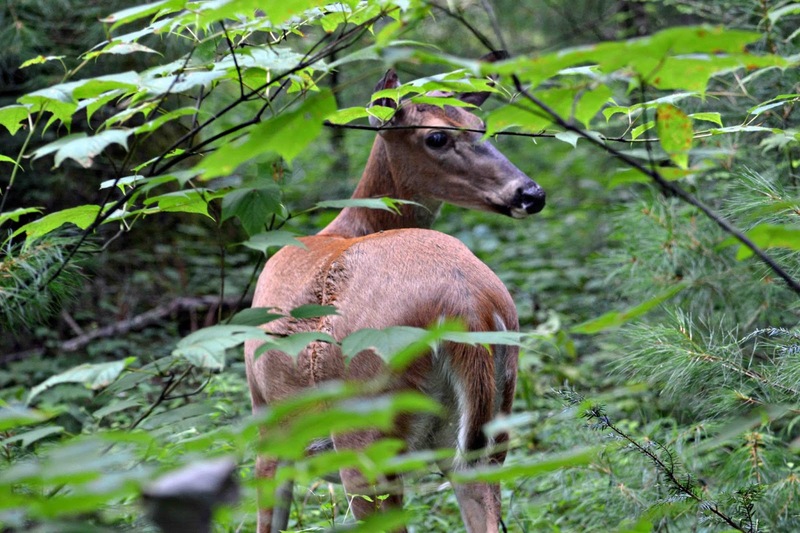 Especially the one with the deer, good call going back for that. My favourite summer holiday was easily Gold Coast 2012. It was the moment my core friendship group came together properly and there were some bloody awesome memories. My most memorable summer vacation was when we went on a safari. I was very little but it is something that sticks in my mind. It seems a close to nature trip. I feel like going on a vacation like NOW! Totally know the feeling of feeling sick bored at home!! I really wanted to go horseback riding this weekend, but the state park had it shut down because it was too hot. I don't think it mattered what the temp. was back in the day. This year we spent 10 days in Florida between LegoLand and Walt Disney World! We had a blast! 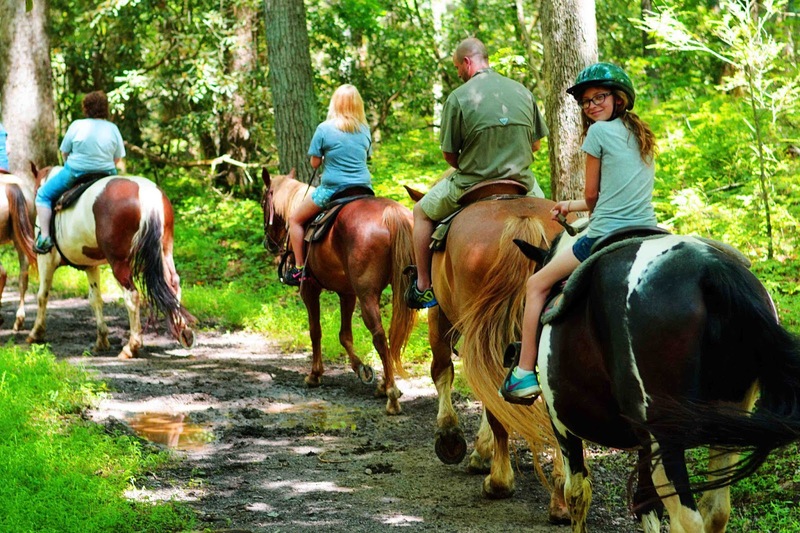 A sweet, cute, AND outdoorsy family! My most memorable was a week long trip to Yellowstone National Park several years ago. My most memorable vacation was the first time I drove across the country. I drove from Florida to California and Nevada.I loved staying in little towns in Arizona and western Texas. My most memorable vacation was when I was a kid and we would go up to the mountains and stay with friends of my parents. They had kids our age so it was always a blast. My most memorable vacation was as a child when we went to LA. We did the Grand Canyon and Disney! I have been to Tennessee, but never to this wonderful place. Man... looks like something I would really have enjoyed. We are headed that way in a couple of months. My most memorable moment was traveling west to Colorado to see my brother with my twin sister. It was our first time flying but luckily we had each other to keep us company. We had a great time out there and it has been over 15 years since we had the chance to go back. I hope to do it soon. Of course it's ok! Thank you for helping to spread the word! I would have to say that is when I learned inner peace and spirituality. Most memorable summer vacation was when we went back to Japan for a friend's wedding, and got to enjoy all the summer festivals and fireworks! My most memorable vacation is when we piled in the car and did a 36 hr cross country trip with two kids and being 7 months pregnant. There were a million stops and sight seeing lots of pee breaks and long winding roads. I thought we would never get to our destination but when i look back it was actually a great bonding experience lots of talking and telling stories. Several years ago, when my daughters were quite young, we took a trip to see Colonial Williamsburg and several other locations in the Virginia area. We had a blast, and they want to go back again. My most memorable vacation was the first time I spend time at the beach. I had so much fun collecting sea shells, swimming and making sand castles. My most memorable summer vacation was last month. We drove from MS to ME for the first family reunion in 10 years. I loved seeing all of my relatives and especially seeing my dad who I have not seen in 4 years. We took a 3 week vacation up to Canada, all the way east to PEI, then down to Washington, DC and then back to Colorado. The one I remember most is from childhood when my parents took me to cedar point. We went to Florida and visited Disney World. Everyone had a blast and fun time. Expensive for sure! My most memorable trip was going to Disney Land with my family when I was younger. I enjoyed Disney World with my family, I also took my 80 year old mother. My most memorable summer vacation was about a year after my divorce. I took my 5 children (12 & under) camping for 2 weeks in Yosemite. We had a marvelous experience. My most memorable summer vacation was in 1994 when I took my 3 daughters to Walt Disney World. It was to be our last vacation together as I lost my middle daughter since then.